Welcome to the watercolor teacher Brigitte Charland. I was only 5, and living in Magog, when my father decided to buy an art store, Art & Photo inc. He felt right away that I was anxious to touch to everything in the art's departement. He gave me "carte blanche" to expirement with arts n' crafts and collage. It did not take long before I wanted to invest myself, aside from my studies, into fine arts. I took the time to experiment with oils, pastels, charcoal and other mediums, but I chose watercolor for its brilliance, transparency, purity and challenges. Now a days, I also appreciates the enviro-friendly side of watercolor. Through photography, I learned to see and describe the brightness of light and shade, their shapes an wide range of delicate nuances. My many original photographs are the source and inspiration of my paintings. They are the result of a meticulous choice of pigments to render texture or silkyness, pure whites or luminous darks. With watercolor I express myself, my moods... without words, and brings out the warmth and radiance of luminosity through my subjects even in a cloudy setting. I will make you feel the wind, the fog, the hot humidity of the sea breeze coming in, or the warm morning sun on flowers, or the cool colors of sundown. My learning path looks like this; when I decided to concentrate my career with watercolor, I went and got some techniques from a good watercolorist I knew, to clarify some snags I have been experimenting. Then, I concentrated my efforts on learning all the mixtures of color I could produce with my palette by making color charts (like the ones in the section techniques). That learning process printed in my memory wonderfull mixes I could do in transparency and most important, that I could remix on demand. My color choices were well-thought and planned now. A very important and significant step in creating my own style was when I decided to experiment and create all the grey tones I wished with the primaries, and not the greys in tube that I found dull and opaque. I put many hours in developing my approach with shadows and reflections. I would study very carefully all the fine details of my photographs and discovered all the shades, hues and different textures of greys. I give a lot of place to colored shadows and reflections in my paintings now. It gives me pleasure and challenge to render them originaly and captivating in a composition. 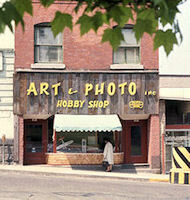 My father's art store Art & Photo inc.
Now passed away, my dad knew deep inside that I would become an fulltime artist. I never missed an oppertunity to thank him for encouraging me in exploring my artistic side through my childhood and adolescence. Thank you daddy, and thank God for the gift.